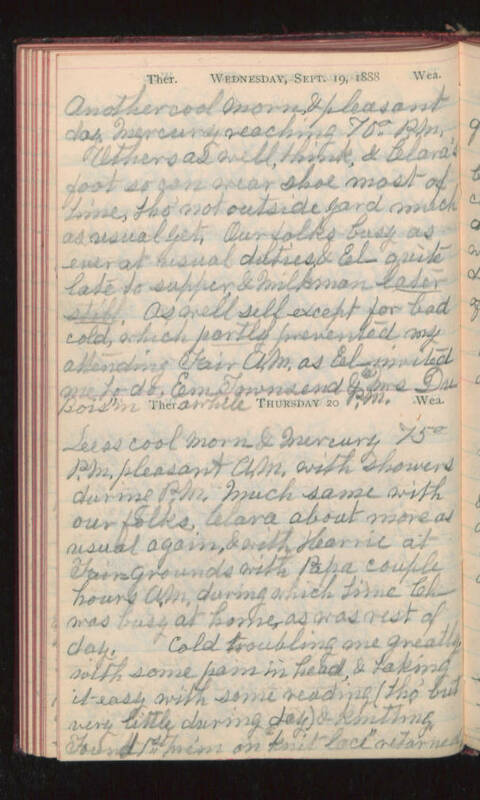 Wednesday, Sept. 19, 1888 Another cool morn, & pleasant day. Mercury reaching 70° P.M. Others as well, think, & Clara's foot so can wear shoe most of time, tho' not outside yard much as usual yet. Our folks busy as ever at usual duties & El- quite late to supper & Milkman later still. As well self except for bad cold, which partly prevented my attending Fair A.M. as El' invited me to do, Em Townsend & "Mrs DuBois" in awhile P.M. Thursday 20 Less cool morn- & Mercury 75° P.M. pleasant A.M. with showers during P.M. Much same with our folks Clara about more as usual again, & with Karrie at Fair grounds with Papa couple hours A.M. during which time Ch- was busy at home, as was rest of day. Cold troubling me greatly with some pain in head, & taking it easy with some reading (tho' but very little during day) & knitting. Found 1st (Trim?) on "knit lace" returned.